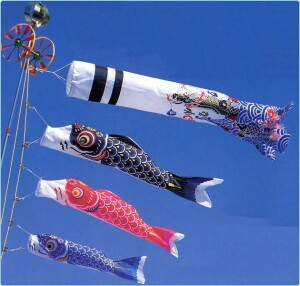 In May you may see carp streamers “swimming” against a clear blue sky. During the national holiday of Children’s Day, families put up koinobori (carp streamers) on a flag pole to pray for the growth of little boys. It is one of the traditional events of Japan, a day called Tango-no-sekku. The custom of flying koinobori started in the middle of the Edo era. During a seasonal event called Tango no Sekku, samurai families used to raise a flag called Musha nobori in their yards. 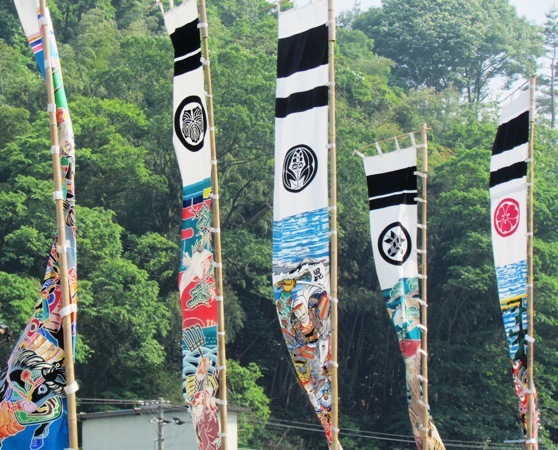 Musha nobori are flags used by military commanders of the Sengoku era. Have you seen samurai movies with long flags featuring the family coat of arms? That’s precisely the start of the koinobori! The custom that started with samurai families flying their family crest, eventually was adopted by the general public who imitated the samurai by flying carp streamers. It is said that the carp climbing the waterfall becomes the dragon! It is common to fly three koinobori streamers. The black, largest carp to represent the father. A red, medium sized carp to represent the mother. A blue, small carp to represent the child. The black carp (the father) expresses winter water. During the winter when all animals cease activity, water, the origin of life, becomes even more essential. This is similar to the role of the father, who, silent and confident, is the pillar of the family. The red carp (the mother) expresses summer fire. Summer is the season of growth for many organisms. Fire represents human wisdom and the source of civilization. This represents the role of the warm, compassionate mother, who gives birth and rears children, and builds wisdom of daily life. And the blue carp (the child) represents trees in spring. Spring is when grass sprout, and is the season when all life grows quickly. Like a young sprig in spring, a child grows virtuously, freely. In this way, the carp streamers is a representation of a happy, peaceful family life. 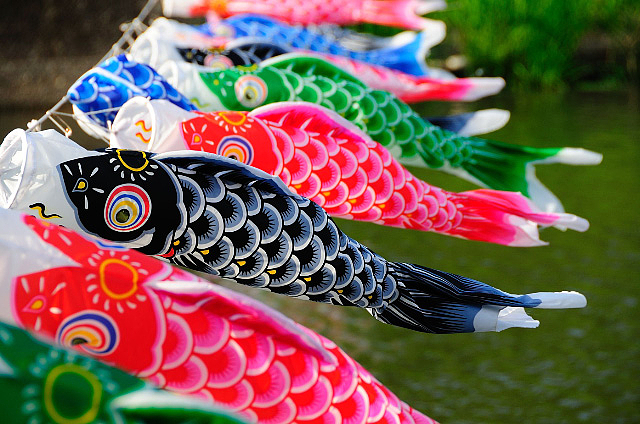 Knowing all this, doesn’t the koinobori look even more appealing? Koinobori encompasses parents’ wishes for their children to grow in health and prosper. The koinobori is proof that in every age, parents place great love and care in rearing their children. The koinobori is a beautiful May scene.